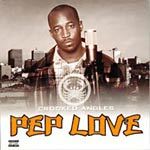 First single off Pep Love's debut. Features vinyl only Crooked Angles and b-side Act Phenom from the album. Production: 1-4 by A-Plus, 5-7 by Domino. All cuts by Jay Biz.